This is a collection of the best gaming WordPress themes for gamers and game review magazine websites. If you want to build a video games and console review site, online gaming magazine, or a game news blog these premium themes have been built and styled specifically for gaming websites. Most of the themes are mobile friendly with responsive designs and include functionality or support for things like reviews and ratings, forums, game guides, game walkthroughs and more. They also include options to easily control and customize the layout and styling allowing you to make your website look unique. If you want to build a WordPress games website covering the latest news and game reviews for the Xbox One, PS4 PS Vita, Xbox 360, Wii U, PS3, Nintendo 3DS, iPhone games, Android games or others you’ll find a great gaming WordPress theme below. Gauge is a review WordPress theme ideal for game review websites. It has a professional magazine style design with a featured slider up top and sections for the latest gaming news, reviews and articles. The premium theme has a fully responsive design so its mobile ready and will adjust to look great on any screen size. Some of the other key features of the theme include: a layout builder to build your own page layouts, review system with a nice ratings display and good / bad points section, user front end review posting, hubs page (central page for info about a particular game – news, reviews, videos etc), video headers, AJAX filtering, portfolio options, BuddyPress and bbPress support for a forum, mega menu system, WooCommerce integration, icon fonts, unlimited sidebars and more. Games Zone is a new premium gaming WordPress theme from ThemeFuse. The mobile responsive theme has a fresh and professional design that is ideal for gaming magazine, gaming blogs and gaming review websites. The theme offers some great features for gaming websites and has a handy admin panel to easily customize and control the site. Game Zone allows you to add and filter game reviews, games, ratings and comes with a bunch of specific pages like reviews, games, walkthroughs, guides and more. Some of the other interesting features of the theme include: built in advertising options, shortcodes, events calendar, a mobile responsive design, infinite colour options, textures and background images, one click auto install, Google fonts, custom widgets and more. Explicit is a professional looking and feature packed review and magazine WordPress theme ideal for gaming websites. The premium theme has mobile first responsive design that will work on all mobile devices such as iPhones and Android devices. The unique magazine style homepage allows you to display a lot of featured content and reviews. Some of the other key features of the theme include: category icons and colours, AJAX powered mega menu system, touch / swipe slider, infinite load options, AJAX sorting and paging, editor and user ratings plus 4 different ratings styles, unlimited criteria for the ratings, large attractive billboard post layouts or classic post layouts, various elements for visitors to interact (social sharing, reader reaction stats, likes and views etc), featured videos, rich Google snippets and schema.org reviews integration, image galleries, various page layout options, custom backgrounds, directory builder and more. Game Addict is a responsive WordPress theme for game websites. The premium theme has a magazine styled layout and appropriate colour scheme for a games site. The theme allows you to create and manage clans wars – create teams, add games, maps and manage team matches. Some of the other features of the theme include: a rating system, unlimited colours and backgrounds, drag and drop page builder, bbPress compatibility, portfolio gallery, parallax slider, BuddyPress support, WooCommerce plugin ready for a shop, WPML support for multiple languages, theme options, and more. Indi Gamer is a gaming review WordPress theme designed specifically for gaming review websites. The premium theme from cssigniter is perfect for running a gaming reviews site. Features include 3 homepage layout options, 4 listing page layouts, an inbuilt review system, top rated reviews widget, shortcodes and more. It has a responsive layout so it’s accessible and works beautifully on all devices from mobiles to desktops. Orizon is a WordPress theme for gaming news, gaming reviews and entertainment content. 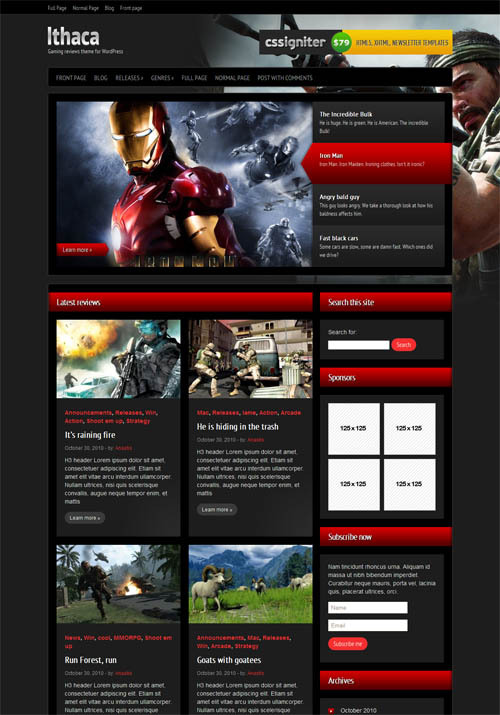 The theme has a blog style layout with a dark colour scheme suitable for gaming sites. Some of the key features of the theme include: a responsive design, custom backgrounds and 2 different colour schemes, ratings system, BuddyPress and bbPress support, galleries and more. Ithaca is a gaming WordPress theme from cssigniter designed for gaming review websites. The theme includes 5 color schemes, flexible featured content slider, custom widgets, options panel, advertising options, custom widgets and more. Oblivion is a multi-purpose gaming WordPress theme with a mobile friendly responsive layout. The premium theme allows you to easily build a games review site or portfolio for your games. Its built with Bootstrap and the latest HTML5 and CSS3 techniques. Some of the other key features of the theme include: ratings system, unlimited colours and backgrounds, bbPress compatible for a forum, drag and drop page builder, parallax slider, WooCommerce ready to sell products, BuddyPress support to start a community, video blacks, animated images and icons, extensive theme options and more. News Setter is a slick and modern magazine WordPress theme perfect for gaming and game review websites. The premium theme from Theme Fuse has a couple of different header styles, 4 colour variations, the ability to set any shade you’d like for the texts and titles, from an easy-to-use colour picker. It has special review page templates with all the features your need to present your product reviews. There are also other custom page templates and lots of shortcodes to style and present information in a beautiful way. The theme also sports a mobile responsive design so will it doesn’t matter if your visitors are viewing on a desktop, tablet or smartphone they will get an optimized experience. Rhino is a gaming WordPress theme from Tesla Themes designed for gaming bloggers or game developers to showcase their games. The premium theme from Tesla Themes is designed for gaming blogs or gaming magazine websites and allows you to blog about the latest gaming news and new game releases, review games and also run a gaming forum. Some of the key features of the theme include: a mobile friendly responsive layout, bbPress integration (so you can have a gaming forum on your site to build a gaming community), newsletter subscription system, revolution slider, shortcodes, color customization options, Font Awesome icons, translation options, HTML5 & CSS3 code, theme options panel and more.